Pronounced (pe/la/tez): A series of exercises that are often done with special equipment. The origin of Pilates was conceived in the 1920s by Joseph Pilates, a physical trainer. The purposes of the exercises were for rehabilitation. The first people to try Pilates were soldiers returning from war and dancers. This method of exercising helped to heal their injuries and strengthen their bodies. Most classes start with the fundamental principles on the mat. 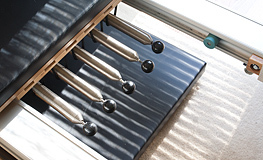 As with STOTT PILATES™, the five principles of Pilates are breathing, pelvic placement, ribcage placement, scapular stability and mobility, and cervical (neck) placement. Once the principles are practiced along with the exercises, clients may then move on to the equipment of the Pilates repertoire, such as reformer, stability chair and cadillac, as well as barrels. All the equipment integrates with the matwork—one piece is not better than the other, rather they complement each other. The Essence of Movement offers Pilates classes for everyone. Whether you’re a Beginner or an Elite Athlete, Pre-Natal or Osteoporosis or joint replacement, we have the class that’s right for you. We offer Group Classes, Private, Duet, and Trio Classes. We offer a beginner Mat class Level 1, and Level 2 for the seasoned Pilates enthusiast. 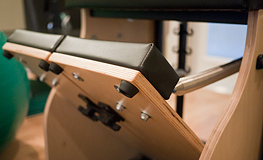 As well as several types of Pilates Equipment classes. Please see the calendar below for classes available.